The North Country Spinners Guild is pleased to sponsor a hand spun skein competition. Ribbons and premiums will be awarded to Best in Show and the top three skeins in each class. Judge’s decision is final. ENTRY FEE: $2.00 per skein. Please make checks payable to North Country Spinners Guild. SUBMITTING SKEINS: On-site skeins will be accepted on Saturday between 8:00 AM-10:00 AM at the North Country Spinners Guild booth. No skeins will be accepted before this time. Make sure to include a completed entry form and payment along with your skeins. If you would like to mail your entries, please contact Cynthia Manno at Cynwiese@aol.com. All mailed in entries must be received by the Thursday before the competition and must include a completed entry form and payment. If you would like to have your skeins mailed back to you, please included a self-addressed envelope large enough for your skeins and sufficient postage. If someone is picking up your skeins, please write their name on the entry form. JUDGING: Judging begins at 10:00 AM. The judge reserves the right to split a large class, move a skein to a more appropriate class and/or disqualify a skein that doesn’t follow the rules set forth. SKEINS: Winning skeins will be on display during festival hours on the Sunday following the competition. All entries must be claimed on Sunday between 3:00-4:00 PM unless prior arrangements have been made. All skeins left after this time will become property of North Country Spinners Guild. Even though diligence will be exercised in the care of all entries, North Country Spinners assumes no liability for lost, stolen or damaged entries. Skeins must be the work of the submitter and must have been spun since the previous year’s GSSB Festival. Skeins must be properly finished and securely tied using figure 8 ties in at least 4 places. Skeins should be a balanced, 2-ply yarn except where otherwise indicated. Skeins must be 1 ½ to 2 yards in circumference and at least 50 yards in length except for Class 4, Challenge Classes 12, 13 and 14 were only 20 yards are necessary for each skein. Skeins may be either natural colored or dyed. For each skein, write your name, address and phone number on a 3 X 5 -inch index card. Put this index card in an unsealed envelope and tie it onto one of the figure 8 ties. Finishing Technique: how your skein was finished and what you used to finish it. Wool Blend: must be at least 50% sheep’s wool. Please specify percentage of each fiber. Novelty Yarn: crepe, marl, spiral gimp, boucle, snarl, slub, beaded, corespun, etc. Each skein should be at least 20 yds in length. Animal: must be 100% animal fibers other than sheep. Please specify what fibers are used and the percentage of each fiber. Plant: must be 100% plant fibers. Please specify what fibers are used and the percentage of each fiber. Novice: any skein produced a spinner who has been spinning for 1 year or less. Junior: any skein produced by a spinner under the age of 18. Spindle: skein entirely spun and plied using any type of spindle. Other: any other fiber or technique, ie. Navajo, chain, multi-plied yarns. Fleece to Yarn: must start from a raw sheep’s fleece and process the fibers oneself. 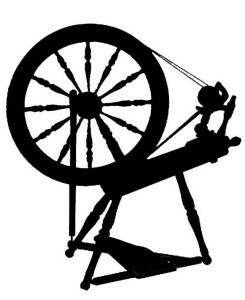 Spinners can choose to spin in the grease or with scoured fiber, comb or hand/drum card the fibers and/or dye the wool but each step must be done by the spinner. All stages must be documented with samples of each stage. Breeder’s Skein: skein spun by the breeder entirely from fiber(s) from their own flock. Can be sheep’s wool or fiber other than sheep’s wool or a combination. Please specify the fibers used and percentage of each fiber. Spinner’s Basket: basket of your choice containing between 3-5 skeins. Skeins may be different colors, fibers and techniques but should coordinate to create a pleasing effect. Each skein should be at least 20 yds in length. Each skein should be at least 20 yds in length. Textile Yarn Swatch: the swatch may use your choice of technique (knitting, crocheting, weaving). It should be washed and blocked or felted. The following four components should be attractively mounted on an 8 X 11 inch matt board or poster board. The swatch should be attached across one edge to the board so that it can be easily examined by the judge. The overall appearance of your skein matters. Make it as visually appealing as you can. When choosing a yarn to make the figure 8 ties, consider using a yarn that doesn’t clash with your skein. Often the best choice is a thin cotton tie or some of the yarn from the skein itself depending on how it was spun. But remember that the ties have to be strong enough to hold the skein together. Rather than leaving two loose ends for the beginning and end of the yarn, tie the ends together so that the skein is one continuous loop. Make the figure 8 ties loose enough so that the strands slide easily but not so loose that the skein looks sloppy or falls apart. A good rule of thumb is that you should be able to slip two fingers under the figure 8 tie. Wash your skein to remove dirt/oils and bring out the true twist. Because this can cause a skein to distort, we strongly recommend re-skeining and re-tying the yarn after washing and drying. Check to see if your plied yarn is evenly balanced after washing and re-skeining. Hold the skein up to see if it twists strongly to the right or left. If so, add or subtract some twist by running it through your spinning wheel again in the appropriate direction until the yarn is balanced. **JUDGES WANT FULL DOCUMENTATION** Documentation helps the judge to better assess your entry. Remember to thoroughly describe your skein especially how it was prepared and spun as is set forth in the rules. It is better to provide more information than not enough. If you are not sure what you intend to do with your yarn, write down a project for which you think the yarn is suitable.